On Friday 16th March 2018 sixteen children (split into two teams) represented Chilcote in a South Birmingham Year 4 and 5 7-a-side competition. In total there were fifteen teams, split into four groups. Chilcote’s Year 4 team were in a group with Our Lady of Lourdes, Acocks Green and Severne Road. Chilcote’s Year 5 team were in a group with Yardley Wood and St Ambrose Barlow. 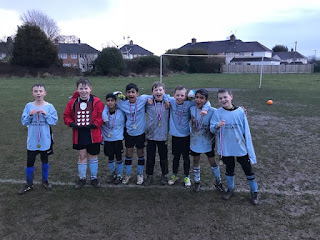 Chilcote’s Year 5 team played against Yardley Wood first and despite dominating the game and having a few chances they drew 0v0. They then played St Ambrose Barlow and the same happened again although with 15 seconds remaining Chilcote managed to score a goal and win 1v0. Then, Chilcote played Yardley Wood again and had even more chances and all of the possession but again couldnt score and drew 0v0. In their final game they played St Ambrose again and needed a draw or win to finish top of the group. They managed to get a 0v0 but agin they probably should have won the game. This meant that they qualified for the semi finals. Chilcote’s Year 4 team started with a game against Severne Road and dominated the match and scored a few goals. They won the match 4v0. They then played Our Lady of Lourdes and lost 3v1 in a game that could have gone either way. Finally they played Acocks Green and won a tight game 1v0. With all the results in, Chilcote finished in second place in the group and didnt qualify for the semi-finals. In the semi-finals Chilcote’s Year 5 team played against Wheelers Lane. It was a close game but Wheelers slightly shaded the game in terms of chances and possession. Just before the end of the game Wheelers had a smashing shot but Benjy pulled off a world class save! Neither team could find a break through and the game went to extra time. In the first moments Chilcote had a long range shot and the keeper saved it but dropped it at the feet of Chilcote’s striker, Ben who smashed it in. Chilcote won the game 1v0 and progressed to the final. In the final Chilcote played against Meadow Green. They dominated the game and had ten chances to score but the Meadow Green goalkeeper managed to stop and save everything they threw at him. The game went to extra time and neither team managed to find a break through. The match went to penalties. Chilcote scored their first and so did Meadow Green. Both teams then scored their second penalty. Chilcote scored their third but Meadow Green missed theirs with Benjy saving the shot. So Chilcote won the final and progress to the Birmingham wide competition. Well done to both teams who did really well and represented the school superbly!! !